Over the course of the health-care reform discussion, we’ve gotten pretty good at talking about the insufficient benefits of reform. It doesn’t cut costs as much as we’d like, and it doesn’t cover all of the uninsured, and it doesn’t have a public option, and so on. But one of the hardest things to convey is the terrible cost of inaction, which is much higher, both in human and economic terms, than many realise. The big player on the cost side is that even small benefits compound over the years. Slowing the system’s spending growth by 1.5 percentage points — so the rate of spending inflation will be six per cent, rather than 7.5 per cent, in a year — doesn’t seem like a terribly impressive outcome. 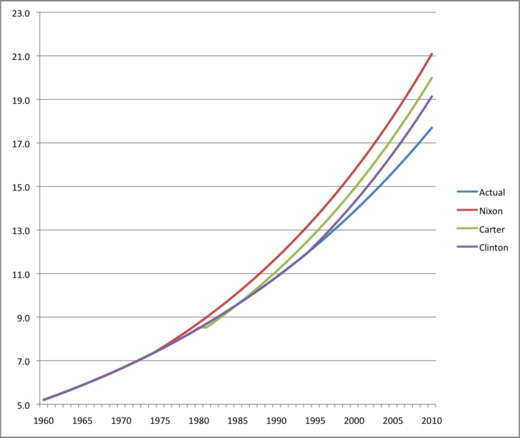 That still has the system growing faster than GDP, or inflation, or Europe’s health-care systems. But over time, the benefits would be enormous. The Commonwealth Fund, in a very smart piece, tries to show this by tallying the savings if we’d instituted the Nixon, Carter and Clinton reforms and they’d worked to slow spending by the aforementioned 1.5 percentage points. That’s just a tiny increase in the rate of health care cost inflation–just 50 basis points a year. Boy, it sure looks like we dodged a bullet, doesn’t it? Every year you delay is more money saved! But this is trivial: we can assume whatever we want! Health care proponents will point to other countries. 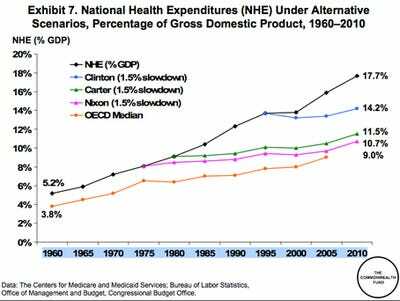 Opponents will point to the history of programs like Medicare. Who’s right? Obviously, I have my opinions, but I can’t prove the counterfactual. Neither can anyone else. All these sorts of graphs are is a pretty way to prove that if you were right, you’d be right! Which is true, but not interesting.